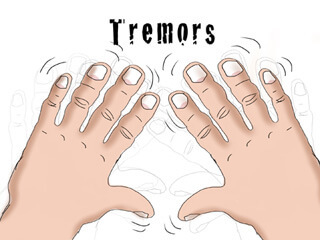 A tremor is an involuntary movement of a muscle or a group of muscles. The motion is rhythmic and involves the to and fro motion of one or multiple body parts. While most tremors occur in the hands, it can also happen in the face, arms, legs etc. Though tremors are not life threatening, they could lead to a lot of inconvenience and can also be socially not very welcome. Also, they may be a sign of an underlying medical condition. It is primarily caused by issues in the parts of the brain that control these muscles. Neurological disorders such as Multiple Sclerosis and Parkinson’s disease can cause it. Strokes, brain injuries and neuro degenerative diseases can cause it too. Besides these medical conditions, tremors can also be brought on by drug abuse, low blood sugar, hyperthyroidism, insulin reaction, mental stress, dementia and exposure to cold. Nicotine can cause it too. These tremors are observed only while engaging in a particular activity. When not engaged in this activity, the individual is tremor free and can function normally. The tremors experienced while writing is a fine example of this. One should seek help if a sudden tremor develops out of the blue or if an existing one worsens. When the tremors begin to seriously affect your daily activities. When you suspect that the tremors are a side effect of medication. As with any kind of medical condition or illness, an early diagnosis is always an advantage. If you feel like you need to know more about Tremors and their causes, please do not hesitate to get in touch with us. Next PostNext What Is Hydrotherapy And How Effective Is It?